Rise Up and Come Out Church: Financial Party Crashers :Dow -1300 in 2 days as arrest of Chinese CEO signals 66,666 Arrests of Deep State Operatives China Shot down US Jets with pulse weapon in retaliation!! Have the threats to arrest 66,666 high profile leaders caused a behind the scenes international incident in order to keep Trump and CO. in Line? Arrest of Huawei Founder's Daughter Meng Wanzhou sends stocks in 4% drop. The Dow Plunging more than 750 Points on Thursday was a sign that Deep State Operatives aren't playing. Just the Arrest of Huawei Executive Meng Wanzhou while she was transferring flights in Vancouver send stocks down. 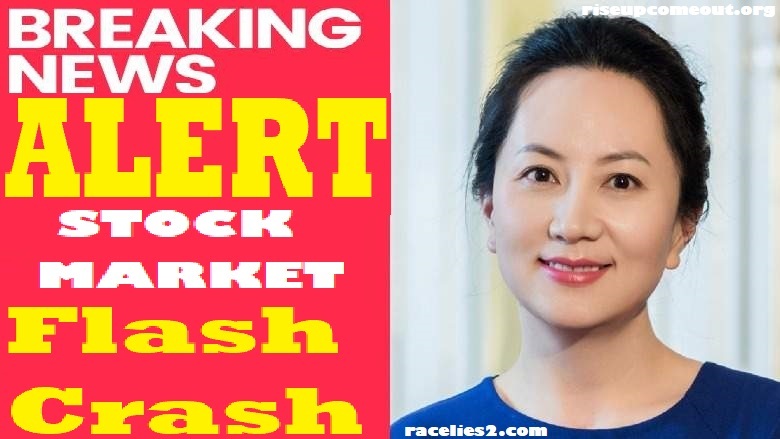 She was arrested on Unspecified Charges Stocks on Tuesday were down 799 Points despite Favorable news on China Trade. China Demands Immediate Release of the Daughter of Huawei founder from Canadian and US custody. Stocks on Friday were down an additional 550 Points. Of course, they are making the lame excuse about job growth, but this is a continuation of the warning by Deep State to get Trump to stop arrests of their people. Did Chinese Agents from a hand cannon position Shoot down the US Marine Jets? A US Marine Fighter F18A Jet and a C-130 Tanker were practicing over the sea of Japan and crashed. What if a Chinese Pulse Wave Weapon was shot to send them a message to release Meng Wanzhou Immediately? China has microwave weapons that can be used in a portable position, by shooting at a target. Is this related to the supposed 66,666 arrests that many speculate will involve high profile leaders in crimes from corruption, ranging all the way up to Child Trafficking and Pedophilia? Many people are out prophesying that over 60,000 high profile leaders would be arrested. Some of those people on the list would have been top corporate names. Is this the first of the major arrests? I don't totally trust this list, because I do know thousands of high profile leaders will be arrested for their political views. Especially, their violent stance to at the very least protect themselves. Many You Tubers will be rounded up, eventually.